FOIMan’s latest article for PDP’s Freedom of Information Journal explores how requests for diaries of public officials should be handled. A few weeks ago I wrote a blog post about FOI and diaries in response to an article in the Guardian. Coincidentally I had just written a piece for PDP on the same subject and I promised to publish it here when it was published. As promised then, here is my latest piece for PDP’s Freedom of Information Journal, on FOI and diaries. FOIMan explains that it can be difficult to keep an official’s diary secret under FOI. The Guardian yesterday reported on the outcome of an FOI request that it made to the (then) Department for Communities and Local Government (DCLG) for minister James Wharton’s diary in 2016. The diary eventually saw the light of day after the First-Tier Tribunal ordered its disclosure. I’ve previously written here about my experience with a request for the Mayor of London’s diary way back in 2006. On that occasion, one of the Mayor’s officials had accidentally disclosed the entire Mayoral diary to a national newspaper, complete with details of the Mayor’s fitness and cosmetic routines. My next piece for PDP’s Freedom of Information Journal, to be published next month, coincidentally covers the subject of FOI and diaries in depth. For the meantime, however, here’s a brief summary of the arguments that public authorities often make in relation to officials’ diaries and their likely success. The information is personal data (s.40(2)): private information, such as Mr Livingstone’s hair and fitness regime, but also his home address can be redacted, justified using s.40(2). This will also be relevant for names of some people that the official meets with where it would be unfair to disclose them (e.g. junior officials, members of the public, etc.). However, it’s unlikely to be unfair to disclose meetings of MPs with Ministers, say. The information is not held: if it is recorded in the diary, it is held – it doesn’t matter what it relates to, or when the event took place (see my previous post on the Lansley diary for more discussion of this point). 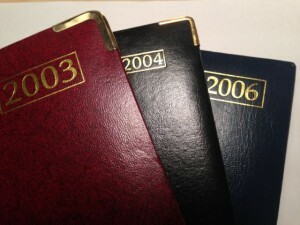 It would cost too much to disclose the diary: it is difficult to argue that s.12 (the cost limit) applies if the applicant just wants the whole diary, though it might be relevant if they are asking for certain types of extract, since this will involve locating and extracting the information. Section 14(1) – the vexatious provision – might be relevant if the applicant has asked for a diary covering a long period of time, if it can be shown that officials would have to spend a vast amount of time identifying and redacting entries from amongst the diary content. Disclosure would prejudice the effective conduct of public affairs/inhibit free and frank advice (s.36): in practice not very successful in decisions reached by the Commissioner and tribunals for similar reasons to s.35. National security concerns (ss.23/24): information about a public figure’s location at particular times may well put them at risk. Information is already published or will be published (s.21/s.22): frankly, this is public authorities’ best option. Adopting a routine schedule of publishing the diary of a prominent official (especially if they know there is interest in this record) means that s.21 (otherwise accessible) can be applied to details already published, and that s.22 (future publication) can usually be used in relation to parts of the diary yet to be made available. As is so often the case, adopting a pro-active rather than reactive approach to this information is of benefit to public authorities. Whilst it means that the bulk of a ministerial diary, say, will end up in the public domain, and that officials will have to carry out work to prepare it, it does allow them to retain a degree of control over what is published and when. It is also going to be easier for officials to prepare the diary to their own timetable than under the pressure of an FOI request deadline. Information that is legitimately exempt under other exemptions can, of course, still be redacted. Watch out for my PDP article on diaries and FOI, which I’ll publish here in a month or so, and which goes into more detail on all this (including examples). FOIMan looks at whether politicians’ diaries are fair game under FOI. Not long after FOI came into force in the UK I returned to the office from an external meeting to find my boss looking a little frazzled. This was never good news at the best of times. Tentatively I enquired as to what had been going on. It turned out that the Evening Standard had published a two page splash on Ken Livingstone’s diary. Splash, as it turned out, was the right word. It included details of the time he set aside for a morning swim. No cuts were in evidence, other than the haircut that was also reported. Someone at the GLA had disclosed the entirety of the Mayor of London’s diary under FOI. The Mayor’s adviser, furious, had apparently hauled the Head of Law out of a meeting to demand an explanation. The Head of Law had in turn tried to find me to find out what had happened, and had instead found my boss, which explained her state on my return. Thankfully, by the time I returned it had already been established that someone in the Mayor’s Office had – against procedure and advice – sent out the whole diary without asking for advice from me as to what exemptions could be applied to it. Phew. Over time, I came to realise that diaries were a sensitive subject. And a decision by the First Tier Information Tribunal this week has reinforced that impression. The appeal concerned a request for Andrew Lansley’s ministerial diary at the time that he was Health Secretary. The Department of Health had released some information but withheld much of the diary under a range of exemptions and other means. The Information Commissioner had ordered that much of the information should be disclosed. The decision of the Tribunal contains some interesting gems. My particular favourite is the argument by the Department that diary entries relating to party political meetings immediately cease to be held by the Department after the meeting has been held. It’s one of those tortuous metaphysical contortions that only government departments appear to be capable of. The Tribunal unsurprisingly gave this short shrift. Another argument advanced by the Department was that the Tribunal should defer to its arguments as to the public interest in withholding information under section 35 of FOIA (the exemption for policy formulation). In other words that there was a strong public interest in just accepting the Government’s version of events over anyone else’s. If this approach were to prevail, it would effectively be game over for any future attempt to overturn the use of section 35. Thankfully, the Tribunal was again dismissive of this argument. regular pro-active publication of the Minister’s meetings and appointments does not satisfy the public interest in disclosure if it excludes certain appointments – for example in this case, quarterly publication of these details excluded video conferences and telephone calls which appeared in the diary. For a more detailed analysis of the decision, including discussion of the decision’s comments on aggregation of public interest arguments, see Tim Pitt-Payne’s article on 11KBW’s Panopticon Blog.